So I like recipe using ingredients with long shelf-life or can be frozen. 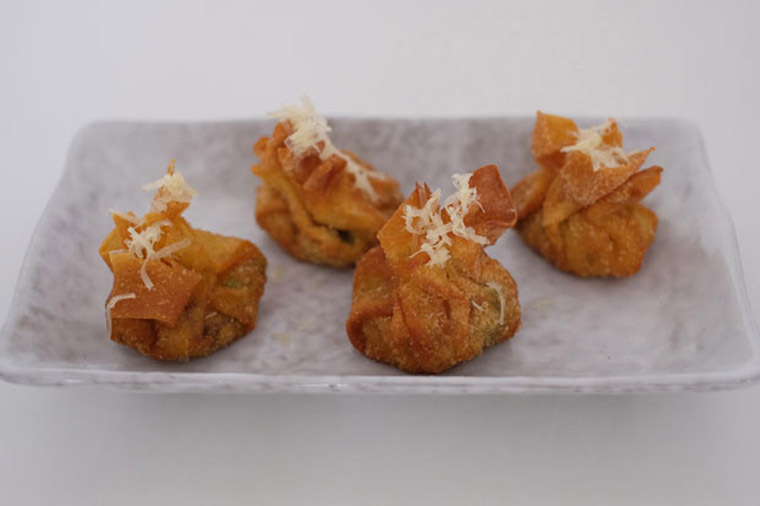 Crispy and cheesy sardine wontons is one of them. Wonton skin can be frozen. Canned sardine can be kept for months. Cheese too can last indefinitely. Carrots can last for weeks and spring onions can last about one week if you store them properly. I’ve tried freezing spring onions and they turn out okay, though not great. This recipe is a great finger food. It’s easy to make, pretty and delicious. I like popping it into my mouth between conversations. I like the crunch and cheesiness is every bite. Oh so yummy! Step 1 TO MAKE FILLINGS: Mash sardines with a fork. 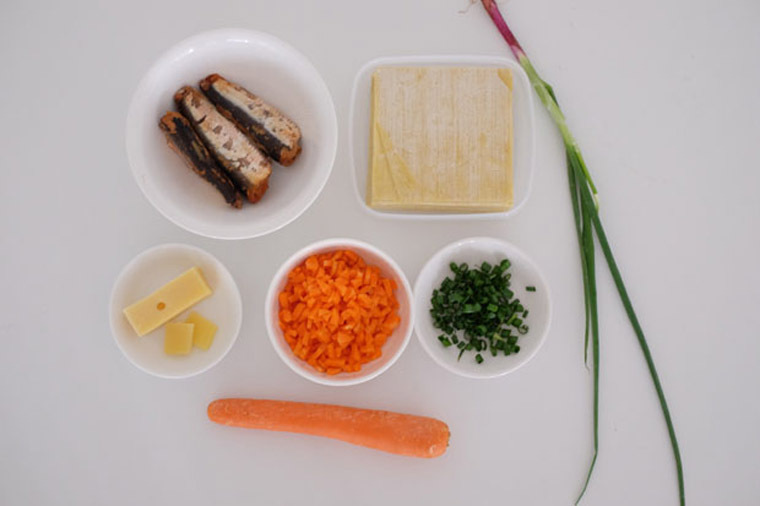 Add spring onions and carrots. Season with salt and pepper. Step 2 TO WRAP WONTONS: Fill wonton skins with a teaspoon of filling each and a small cube of cheese. Wrap into half and secure wonton skin with a little water. Step 3 TO FRY & SERVE: Preheat oil in wok for deep frying. 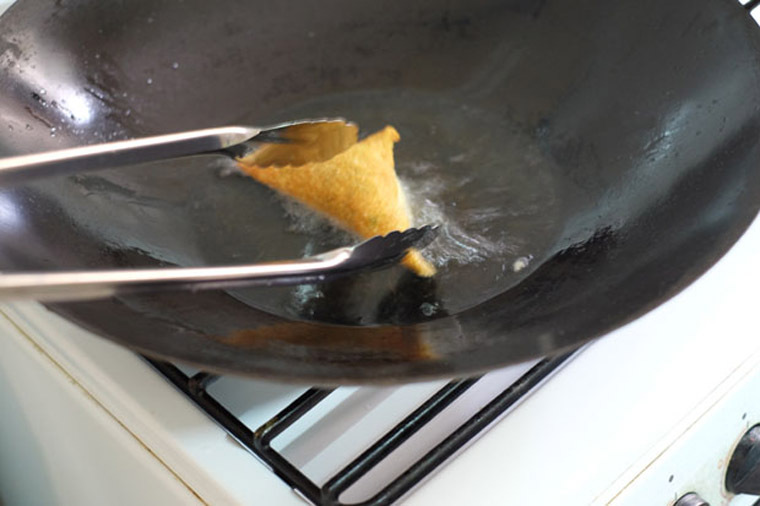 Deep fry wonton until golden brown and crispy. Drain off excess of in paper towel and serve immediately with cheese gratings. 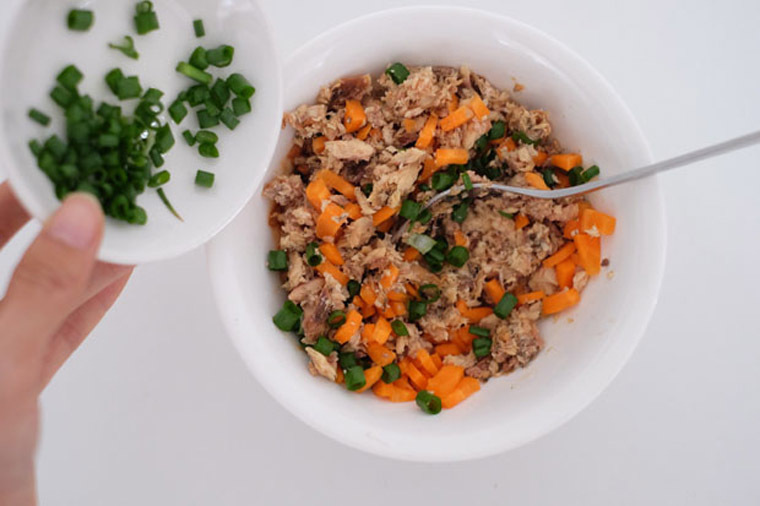 Add 1 canned of mashed sardine + 2 stalks of chopped spring onions + 1 small cubed carrot + salt + pepper in a bowl. Mix well. 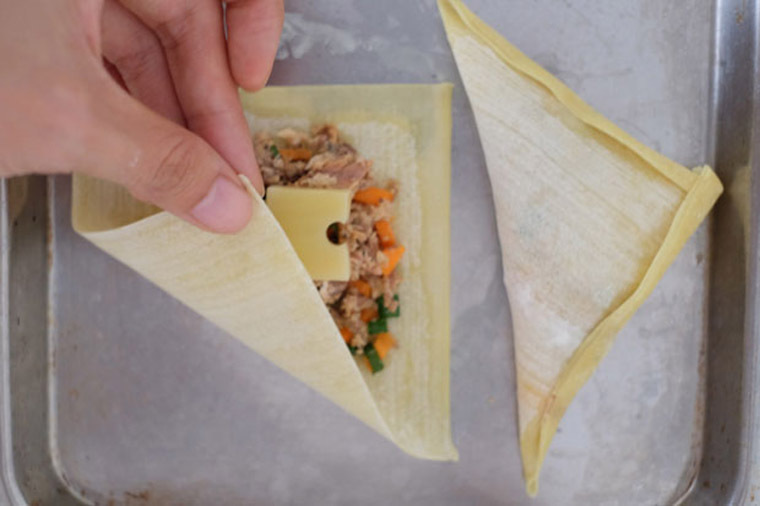 Fill wonton with fillings and a small cube of cheese. Fry until crispy. Serve with cheese gratings. I use emmental cheese as I happen to have a block in my fridge. You can use sliced cheddar cheese too. Sardine can be replaced with tuna. Wrap wanton whichever want you want. I think it’s the best part of this recipe. Fold it into half to form a triangle or scrunch it up like a tulip. If you’re serving it at a party, you can make it prettier by shaving cheese over it. Use a hard cheese like emmental. Don’t do it while the wontons are still hot, otherwise the cheese will melt and look messy. You can serve it with a dipping sauce e.g tomato sauce, chilli sauce, mayonnaise and thousand island sauce. For a healthier dip, try our easy guacamole recipe. Have fun making and enjoying this easy party snack!